The original members of Tranglobal Underground are reunited once more along with Natacha Atlas for a very special London Concert. 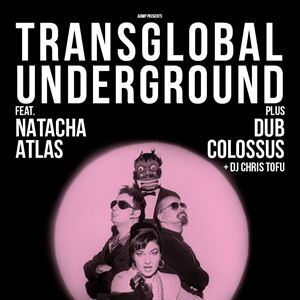 In the early 90s, Natacha Atlas worked with Transglobal Underground on tracks like ‘I Voyager,’ ‘Taal Zaman’ and ‘Shimmer’ creating a whole new genre of British music, crossing oriental and Asian grooves and lyrics with club grooves and live percussion. 25 years after they put that new outline into the British musical map, Transglobal Underground will be marking the occasion on tour reuniting some of the most important musicians involved back in the day, and releasing a compilation celebrating Transglobal Underground’s longterm relationship with original vocalist Natacha Atlas whose own solo career is over 20 years old and has spanned oriental music, electronica and jazz. The original aim of Dub Colossus was to combine the golden years of Ethiopique beats and Ethiojazz with the dub reggae styles of the early 70’s groups like Abyssinians and Mighty Diamonds. The dub element on 'Dub Me Tender', ever-present in the first two albums, has been pumped up – giving these tracks a full Dubulah work over, in the tradition of Joe Gibbs’ African Dub series and Dennis "Blackbeard" Bovell.